Hello to all! A few years back, some friends of ours were selling their store, that included a gun shop upstairs. While rummaging through the stuff they were selling off, I came across the leather case in the photo. I'm quite sure it is for some type of long gun, but no clue just which long gun it is intended for. I'm sure someone here knows. Please enlighten me! 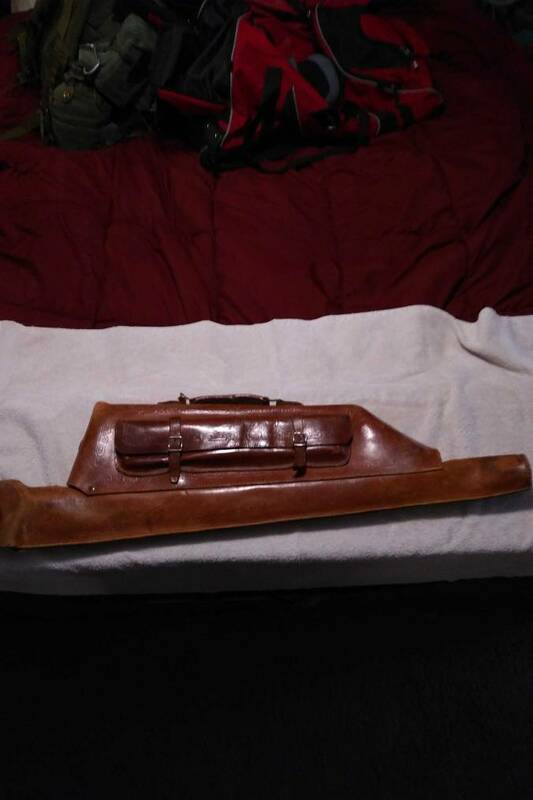 It looks like a soft case for a take-down side-by-side shotgun (or maybe an over-under). It kinda looks home-made, but maybe not. The smaller side compartment would usually be for a jointed cleaning-rod, the top compartment for the buttstock/receiver, and the lower, longer compartment for the barrels/fore-end. But it's hard to tell, since I can't get a size reference from your picture. At the widest point it's about 8.5"
I tried to put my side by side double 12ga in it, but the place where barrels would go is really too narrow for a comfortable fit. I believe a single barrel, single shot 12ga would fit nicely in it, but hard to imagine anyone going to that much trouble for a relatively cheap long gun, but who knows? Maybe it's for a single-barrel trap gun? Or a break-action, single-shot rifle? If it is home-made, as I conjecture, maybe it was made by a kid to house his own very first gun. It's the sort of thing that I would've done, when I was a kid. I'll see about taking some more pics, and this time with a frame of reference like yardstick and perhaps a closeup or two. You could also put some long guns next to it. Would a scope fit in that side pocket? Good idea! I'll try to remember to get it done today!